Happy New Year everyone! Here’s to a happy, healthy, peaceful and prosperous 2014 for you and yours. 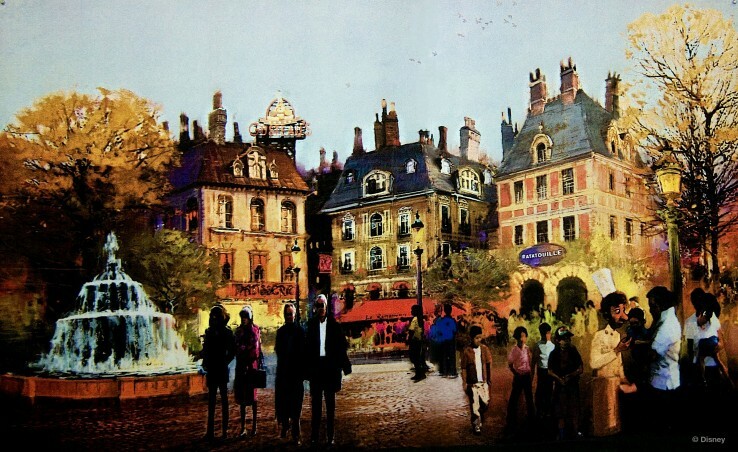 2014 promises to be an even more important year, as this year will at last see the opening of Ratatouille: L’Aventure Totalement Toquée de Rémy, the brand new, much-anticipated 150 million-euro Walt Disney Studios Park dark ride! It has almost been a year since Disneyland Paris officially announced the attraction with a press release in February 2013 and since then there has been little official information, aside from the revelation of the attraction’s official name and the release of a marketing visual via Disneyland Paris Twitter account. Next summer, Disneyland Paris will unveil a major new attraction and mini-land inspired by the Oscar-winning Disney•Pixar film Ratatouille. The film, directed by Brad Bird, tells the tale of Rémy, a young rat who has amazing talents in the kitchen and dreams of one day becoming a great chef. This leads to a fun but perilous journey that eventually lands him as the head chef of one of the most famous restaurants in Paris. Now Rémy has arrived at Walt Disney Studios Park to share his culinary delights and crazy adventures with the entire family. On the attraction Ratatouille: L’Aventure Totalement Toquée de Rémy*, guests will shrink down to the size of a rat and join Rémy and his friends as they scurry through the kitchen, dining room, and walls of Gusteau’s famous Parisian restaurant, all the while trying to avoid the nemesis from the film, Chef Skinner. This first of its kind Disney attraction will immerse guests into an animated world like never before as they experience what it’s like to be a rat in a human sized world. The attraction is located in a new corner of Toon Studio that’s been transformed into a Ratatouille-inspired version of the City of Light. In addition to the attraction, this mini-land also features a shop, Chez Marianne Souvenirs de Paris**, and a rat-scale themed table service restaurant, Bistrot Chez Rémy*. The restaurant, which is the only one of its kind across Disney Parks worldwide, is directly adjacent to the attraction and serves the “little chef’s” famous dish, ratatouille. After Crush’s Coaster(1), Cars Race Rally(2) and Toy Story Playland(3), Ratatouille will be the fourth attraction at the Walt Disney Studios Park inspired by a Disney•Pixar film. Disneyland Paris will once again combine its narration skills with state-of-the-art technology to offer the best possible experience. Next summer, join us for Ratatouille: L’Aventure Totalement Toquée de Rémy, only at Walt Disney Studios Park, Disneyland Paris. (3) Toy Story Playland is inspired by Disney•Pixar’s film Toy Story. So there you have it: a boutique named “Chez Marianne Souvenirs de Paris” and a rat-scale themed table service restaurant named “Bistrot Chez Rémy” will all be part of this amazing new Ratatouille mini-land. I for one can’t wait to take a stroll down this Parisian Plaza! Welcome to Disneyland Paris Treasures! Here we strive to examine Treasures of Disneyland Paris's past, present and future as well as to document and to preserve the history of this most beautiful of all Magic Kingdoms! Copyright © 2008 – 2019 Disneyland Paris Treasures. All Rights Reserved.